Design survey questions that are effective with these simple tips. 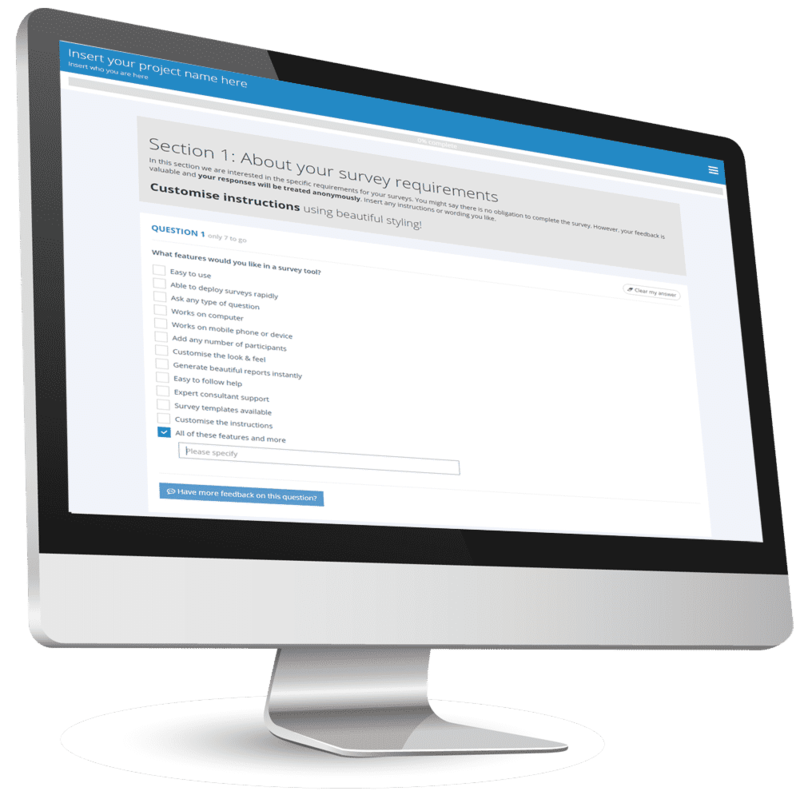 Designing survey questions and creating online surveys makes it easy for organisations to perform research. But, ease of access doesn’t automatically mean great surveys. A great survey needs to be well thought-out, and well planned. Here is a simple 10-step plan that will help you to design surveys that are better than everyone else’s. Once you know what it is, stick to it like glue. Only ask people questions that move you towards your goal. This means all the ‘nice to know’ questions that aren’t strictly relevant need to be left out. The right question type will give you clean data. When thinking about this, remember that open-ended questions that ask respondents to explore issues are tiring for people, and hard to analyse. They leave your results ‘open’ to personal bias, too. These questions include text fields and paragraph fields. Closed-ended questions are quantitative, meaning you can measure them. These include radio buttons, checkboxes, dropdown menus, scales, and ranks. Using a mix gives you the best of both types. You can use open ended questions to help you understand why respondents gave you the answers that they did. Mutually exclusive answers are clean, clear, and direct. Non-exclusive options tend to confuse people. Great surveys ask specific and direct questions. This sometimes means that you need to really think about the answer that you want. For example, if you want to know whether people read a specific newspaper, ask them about that specific newspaper. Don’t ask them if they read a newspaper. Keep sentences short. Use precise terms. Remember that unclear questions give you unclear results. If you design a survey questions with rating scales, make sure each point has the same weighting, with the same number of options on either side of the middle one. This will prevent your data being skewed. Remove any question that is ambiguous, long, or asks people to remember many things, or things from a long time ago. Also, remembering step two above, limit your open-ended questions. They take more time and effort to answer. Tiring questions are much more likely to encourage your respondents to abandon your survey part-way through. Don’t give them the option. People don’t like answering highly personal questions. So, give people the ability to opt out of them. If they are required, your abandonment rate is likely to skyrocket. The simple way to give people an opt-out is to include Prefer not to answer. That way, you will still get good, measurable data, and people will be less likely to give up on you. Great surveys don’t grab respondents by the hand and show them the desired answer. It leads to low-quality data, and doesn’t give you independent results. Check for words that imply things like could, should and might. Question: Farmer’s Union is a popular iced coffee. What brand do you drink? It suggests that by answering with any other brand the respondent could be unpopular. Yikes. Better just to ask which brand of iced coffee he or she drinks. People have a tendency to ask two questions in one sentence. Sometimes this is necessary but at other times doing so may confuse people, and give you poorer quality data. So, when asking more than one thing in a survey ask yourself how you will deal with the results and identify the true issues in the results. You might want to ask a question about meetings such as Our meetings are regular and effective? But the respondent might think the meetings are regular but ineffective. How do they answer that? With something that doesn’t really reflect their experience. By splitting the question, you will have a much clearer indication as to how your respondents feel. Your data will be far better as a result. By forcing people to answer questions before they move to the next one, you will make sure you get results. You won’t make sure you get the best results. It may be better to make questions “Optional” so that participants can move forward without being forced to answer a question they don’t want to. As you can see, much of the time is spent thinking about the data you actually need, and then planning how to give your respondents a great experience. The hard work is always valuable, because it saves you time and effort later. Great survey questions give you great results.